Healthy demand for broadband in the UK hides a viper’s net of problems that the government must address soon or fail its citizens. The UK’s top four fixed broadband suppliers added 1.7 million subscribers in the past year, the firms’ quarterly results reveal, bringing the total some 16 million, a market penetration of 26% of the population. However, in a submission to the department of culture, media and sport’s green paper on the upcoming communications act, the mobile network operators’ Mobile Broadband Group claimed 80 million mobile broadband users. The group noted that rapidly rising demand for data is forcing them into usage caps and throttling. The big fixed broadband winners were BT and Sky who added 904,000 and 701,000 subscribers respectively. The importance of a video component of the increasingly popular “multiplay” package is shown by the average monthly revenue per user (ARPU). 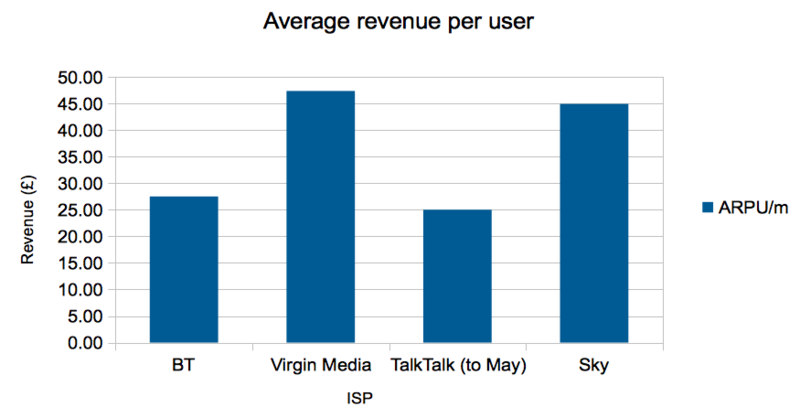 Virgin Media led with £47.35, followed by Sky (£44.92), both almost twice the ARPUs of BT and TalkTalk. Access to video content appears to be whetting an appetite for faster speeds. Virgin Media says half its new customers subscribe to a service of 30Mbps or above. No doubt this is to provide enough capacity to run multiple services at once. Nearly two out of three of Virgin Media’s subscribers take a triple-play, and one in eight add a mobile service. Sky, which delivers satellite TV, says 2.8 million (27%) its customers take a triple-play (TV, phone and broadband), a growth of 37% on the year. BT reports it now has 600,000 subscribers to Vision, its video on demand service. If video on demand is driving broadband demand, Virgin Media is in a good position to take market share. Figures released by Ofcom this week showed that all of Virgin Media’s products provide speeds closest to their advertised headline speeds. Virgin Media claims it can provide a 100Mbps service via a fibre to the cabinet (FTTC) network upgrade to a quarter of the UK’s homes, and that it is on target to pass almost 13 million homes within the year, half of which will have access to 100Mbps. Virgin Media last month completed a successful test running its network at 1.5Gbps at London’s TechHub in Old Street, but this is unlikely to be offered to residential customers in the near future. BT is continuing its own £2.5bn FTTC roll-out. It claims to pass more than five million homes, of which 200,000 have signed up. This gives BT a 4% penetration rate for its “superfast”, up to 40Mbps Infinity service. It is also claiming to be taking the lion’s share of new DSL or copper-based business, by 141,000 of 251,000. 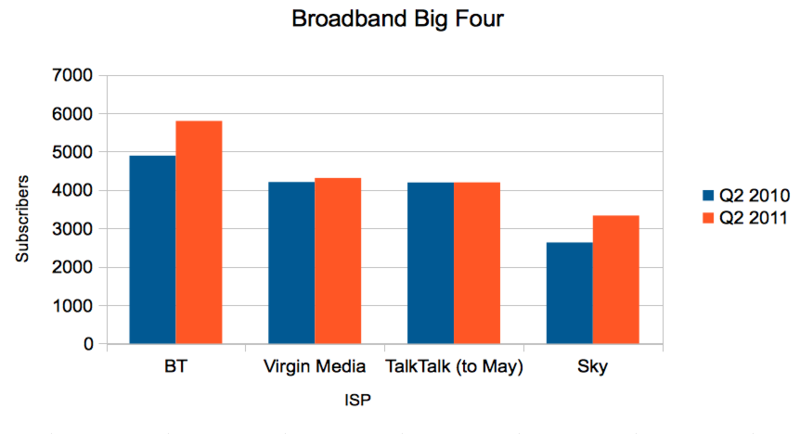 Meanwhile, both TalkTalk and Sky are moving customers onto their own fixed networks as fast as they can to cut costs. The future development of the market is interestingly poised. On the infrastructure side, dozens of counties are waiting for BDUK, the government’s broadband funding agency, to loosen the purse strings to the remaining £400m of the government’s initial £530m earmarked for broadband not spots. However, BDUK appears to have gone into its shell, frustrating counties and community network operators that want to get on with broadband procurements. The future market may also be affected by two court decisions this week. In the first, BT was ordered to block access to Newzbin2, an index of websites that serve illegal copies of film and video content. BT welcomed the decision, saying it affirmed its long-held contention that rightsholders need to go through the courts to assert their rights. In the second, Meltwater, a news aggregation website, lost its appeal against an earlier judgment that its activities infringe the Newspaper Licensing Agency’s terms. According to legal commentators, this decision effectively makes copyright pirates of millions of people who browse the web. The Meltwater decision is likely to increase pressure on the government to address the widely-praised Hargreaves report. Hargreaves’ key recommendation is to set up a tiered online market for licences for digital content. Providing a fast, simple, cheap way for content creators to earn money from their work, without making them the indentured slaves of record companies and film studios, is likely to encourage many more to try their luck. If people can access this extra content cheaply and legally, they are likely to demand more content, and drive up demand for broadband. Unless the government gives some leadership soon on both broadband infrastructure and content , it may find its overall goal of the best broadband network in Europe slipping through its fingers. how can the government give leadership? only a handfull of MPs understand how it works, and they are ignored too. The majority get their emails handed to them on dead trees, and the regulator is part of the same old boys network so isn’t doing anything useful to expose the rot. Yes, I think we are going to be a long way behind Europe at this rate, left in the copper slow lane. Digitalbritain we ain’t. Do virgin media do video on demand over broadband or over the CATV side of their network ? The iPlayer on VM used to be delivered by cable TV not by broadband so was available to all VM TV customers, but not being in their area I wouldn’t claim to be up to speed. “The answer depends on which service the customer is using: if the new TiVo service, then the answer is both. The DVB-C system delivers some while IP delivers extra content such as radio. The customer doesn’t need a separate broadband subscription though (although we’d encourage them to have one of course) as the TiVo box has its own built in modem. “If using the legacy platform (the V+, V HD etc boxes) then everything is delivered over DVB-C.